First impressions really do matter! When selling your home, it is important to consider how your home will be perceived when a buyer looks at the pictures online, or pulls up to tour your property. Sometimes, sellers don’t consider the outside appearance of their home when preparing to sell; instead, they see it as an afterthought. But, the truth is, the outside of your home is the first thing a buyer will see! If the curb appeal isn’t up to par, it can end up effecting the sale of your home. How can you make sure the curb appeal of your home will blow the socks off potential buyers? Below is an infographic to give you a few ideas on where to start. Also, I have a few other little things, outlined below, to give a welcoming feeling to your home! In addition to my suggestions above, here are a two inexpensive ways to add a welcoming touch to the front of your home. Add a cheery-welcoming mat to your front door — this is a very inexpensive way to welcome buyers to your home! It also shows that you have put thought into selling your home. Add new, shiny house numbers to the front of your home — if your house numbers are hard to read it could be nice to replace them with some brand new numbers. They don’t have to be expensive. Buyers will like that you have taken the time to take care of the little things, as well as the big things. According to the statistics above, the amount of time you put into the curb appeal of your home can make or break the sale. So, take some time to work on the front and back of your home before you put it on the market. You won’t be disappointed! 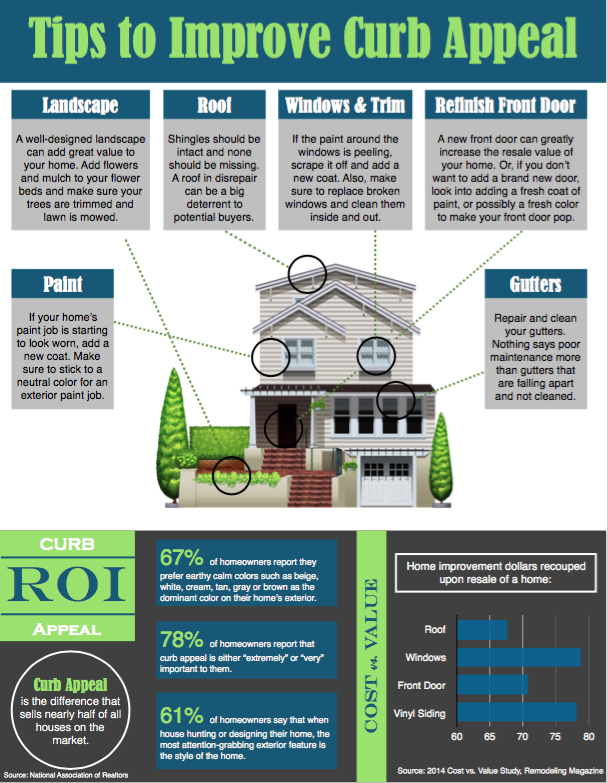 If you have any questions about improving your curb appeal to get your home ready to sell, I’m always here to help! Give me a call anytime.